1763 is the temperature that silver melts. Molten silver can be poured into moulds and formed into castings or ingots. At 1763 degrees silver changes from a solid to liquid, from something relatively hard to something that can flow. 1763 is also a somewhat relevant year. As his silversmithing sales lagged, Paul Revere turned to engraving, drawing cartoons, and even dentistry (one can still hear him on his fateful ride upon seeing the British troops movements screaming, “the fillings are coming”). In 1763 alarmed by the actions of the British empire, Paul began to organize other artisan and craftsmen to protest parliament and the crown. Later, he would further venture into politics and engrave the famous depiction of the Boston Massacre. Artists and art have always had a role on influencing political movements. Art, by its very nature, challenges the status quo by allowing free subjective expression. To the extent that this is true, all art is therefore potentially political in nature. I created these triangular engagement/wedding rings for a wonderfully unconventional couple a few years ago. They had wandered into our old brick and mortar store looking for unique silver and gold jewelry. I am not always able to meet every patron I create work for, so when I have developed a relationship with the people I am working with, it is very special for me. They were clearly in love, and enjoyed the variety of shapes and styles of rings I offered. After some time, we decided to create a pair of these one-of-a-kind triangular shaped rings set with two lovely checkerboard cut London blue topaz. They loved the experience and, of course, their rings. Traditionally, rings are round. The shape has symbolism to many. An unending curved line of gold or silver. But what about other rings of different shapes? Can they be comfortable? Are they wearable? Well, of course, the answer to both questions is an outstanding yes. In fact, I find that people respond in curious ways when they discover that not all rings are round. Many are surprised at the comfort a square shanked ring provides. Some women and man have been unable to wear finger adornments because of the shape of their knuckle joints only to find that a ‘D’ shaped ring I create can accommodate their finger better than a round shape. I have heard the squeals of delight, as women have gone through my showcases trying on a variety of unique shaped rings, finding shapes that suit their specific style and anatomy. It is my pleasure to play with convention and tradition in my art. I love creating these miniature sculptures for body adornment. The interplay and juxtaposition of shape and color are always prevalent in my designs, along with consideration of the overall comfort of the piece. If it was meant to be worn, then it must be comfortable as well as emotionally evocative and aesthetically pleasing. Teaching private jewelry classes from my studio in Tampa Florida. At my bench, one one one, students can learn the basics of jewellery fabrication including piercing, soldering, and stone setting. These traditional techniques and art they create are thousands of years old, culturally significant and in todays world of computer printed and machine produced jewellry, are in jeopardy of being lost. 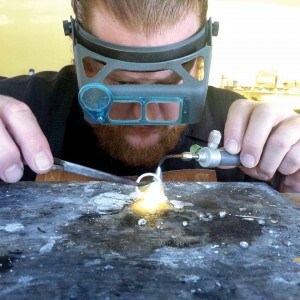 In recent years, there has been a resurgence of artists drawn to the medium, increasing the desire to learn silversmithing and goldsmithing techniques. Artistically adventurous people come from all over the country to spend time at my bench and learn a foundation in this vast medium. Students are often surprised at the amount of time, labor and care that goes into the fabrication of a single piece of jewelry. I love sharing what I do with people, not only because I am passionate about the art I create, but also because we have an obligation as artisans to share our accumulated knowledge with successive generations of craftspeople. Traditionally, rings are round in shape. However, when you examine the human finger you notice that they are not, in fact, round. Our wonderful fingers, which allow us to perform so may tasks- from eating food to expressing our feelings toward the driver who just cut us off, are rounded at the top and bottom and somewhat flat on the sides. Rings designed with the finger’s anatomy in mind are far more comfortable to wear. They also reduce swelling by allowing for venous return from the finger. There are other advantages to alternatively shaped rings. Round rings, when set with gemstones on top, become unbalanced and ‘roll’ on the finger. This change of position of the gemstone in relationship to the finger is not only annoying and uncomfortable, but changes the presentation of the gemstone diminishing the overall look of the stone. Rings should be designed for comfort and style. If the ring is uncomfortable and restricts blood flow it will not be worn. If the jewelry is boring, and doesn’t reflect the wearers personal aesthetic, it wont be worn. Dan Balk working in his studio at his jewelers bench. I am a goldsmith, designer, artist, teacher, and father. 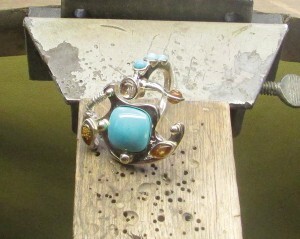 I design and fabricate every piece of jewelry from raw materials in my studio in Tampa, Florida. Each piece is one of a kind, designed by me. I create my own sterling silver, 18K, and 14K alloys that I fashion, mill, forge, fuse, and braze into miniature sculptures for personal adornment. I select and set each stone, often performing my own lapidary work on select stones. 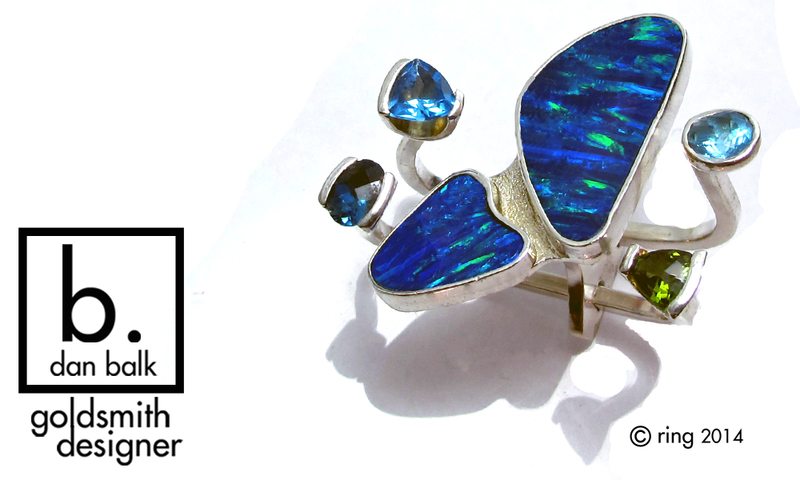 I have complete contact and artistic connection with each piece of fine art jewelry from concept to collection. Hand fabricated ring in sterling silver by Dan Balk. its your world. i just make jewelry in it. These happy clients had custom wedding bands hand made. I love our patrons and enjoy seeing them when they come down to Florida. So happy to have been feature in last weeks the laker, lutz news. Here is a link to the article lakerlutznews. For Dan Balk, creating jewelry for a living wasn’t his original path in life. But, he’s glad it’s turned out that way. Balk, who operates a jewelry studio from his home in Lutz, has been making jewelry since 2008—around the time the United States’ recession was in full swing. With a background in athletic training and physical therapy, the New Jersey native spent 13 years working as an associate dean of education for a massage school in Tampa. Simultaneously, he worked as a massage therapist for the Tampa Bay Mutiny and the New York Yankees. However, once the nation’s economy took a tailspin for the worse, Balk’s seemingly stable career was no more. His massage school went bankrupt, and the Yankees, like many companies at the time, began laying off employees. With a wife and two children to support, Balk was at a crossroads — until his father-in-law, Roberto Vengoechea, suggested Balk make some “trinkets” to sell in the meantime. Taking up Vengoechea’s suggestion, Balk served a 28-day apprenticeship under the guidance of his father-in-law, a master jeweler in Black Mountain, North Carolina. Vengoechea’s tutelage turned out to be a “cathartic” and “powerful” experience for Balk. It was like the planets began to align, he said. “I really, really loved what I was watching him do, and what I was doing,” Balk said. “What a boon for us that I was able to learn from someone who was so well-versed in the trade. The craft of making jewelry by hand is declining, Balk said, due in part to the proliferation of graphic design, 3D printing and overseas production. Balk designs and fabricates every piece of jewelry from raw materials. Typically, the process can involve as many as five or six different parties, from the time a piece is designed until it is sold, he said. Balk handles the entire jewelry-making process—whether it’s a ring, a pendant, a necklace or a bracelet. He leaves the “business side of things” to his wife, Nataly. Depending on the type of jewelry and its complexity, Balk may spend anywhere from a few days to a week on a piece. While most of his jewelry designs are labeled as “modern and futuristic,” there’s essentially no limit as to what Balk can create based on a customer’s request. From that standpoint, each piece of jewelry made by Balk is “one of a kind,” and not constrained to basic round rings and singular stones. One customer, for instance, had rings and pendants made out of antique silverware. Another had a wedding band containing fossilized dinosaur bone. Others have had shark’s teeth and sea glass casted into their personalized pieces. “If you have the idea, it probably can be made. Because I do it all myself, I’m not limited by just the components I can buy,” Balk explained. “Some (jewelers) say, ‘I do customer ordering — these are the settings you can choose, and these are the bands you can choose.’ We don’t do that; we can make anything you want to make. After operating the Singing Stone Gallery in Ybor City for six years, Balk has been working out of his home jewelry studio in Lutz since last August. The change in work location logistically made more sense, especially for teaching jewelry classes, which he’s done since 2012. Balk’s daily “five-step commute” to work allows him to both focus on his craft and teach hands-on, personalized classes in a relaxed setting. With Valentine’s Day fast approaching, men will often surprise their partner by taking them to one of Balk’s jewelry making classes — a unique experience compared to a typical dinner date. “I’m not against a good meal, and they are memorable when they are good, but you have that night, you eat your food and the next day, you’re done. This kind of thing—you’re making a memory,” Balk said. “It’s an experience as well as a timeless piece that you keep forever,” Nataly said. For more information, call (813) 728-4325. Just getting this blog set up. I am an artist, goldsmith, and designer. I enjoy working with noble metals like gold and silver. I like designing with precious gemstones. There is a connection between artists and the materials they choose to work with. It is humbling to work with these geological wonders that have been formed by the earth over millions of years….